Peter Whitmore was born and raised in Orange, Massachusetts. Under his mother's instruction he started riding and showing horses at a young age. He began his show career showing in the 4-H walk-trot division on his first horse, "Snickle Fritz". Snickles taught Peter the love and patience that are still the foundation of his training philosophy. He later moved on to an Appaloosa gelding "Eyes A Tomahawk", who carried him through the remainder of his 4-H career. Peter continued learning and developing his horsemanship through 13 years of committed 4-H membership and by working closely with his mother, trainer and instructor, Sandy Whitmore. 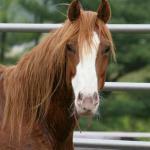 At age 18, Peter's first clients were the owners of 3 wild Chincoteague Ponies and an Appaloosa filly. They were confident in his abilities and agreed to pay him in advance so he could buy his first round pen, thus "It's A Pleasure Training" was born. Peter owes his success to their faith in his abilities and to his family's constant support and guidance. Today Peter still lives in Orange with his wife Jessica, daughter Thea, and son Isiah. Peter continues to train at the family farm using the round pen, indoor and outdoor arenas. Training all breeds, ages and disciplines. Whether he is in the saddle or in a cart, Peter rarely goes a day without working a few horses! Peter has competed locally and nationally on the Crimson Acres Glory Riders Drill Team and in the Craig Cameron's Extreme Cowboy Races, and the Extreme Mustang Makeover. In his "spare time" Peter also works as a special education teacher, is President of Dare to Dream Educational Farm Program and the New England Equestrian Center of Athol (NEECA).